PAUL COOK vowed he’s not frightened of cashing in Pompey’s bankable assets to fund his rebuild. But the Blues boss promised any player departing will be for the benefit of the club. And Cook has insisted he’s under no pressure to sell players as Adam Webster prepares to join Ipswich Town. The Tractor Boys are close to landing Webster in a deal worth well in excess of £500,000, plus Matt Clarke. The 21-year-old has to negotiate personal terms before completing the move to the Championship side. 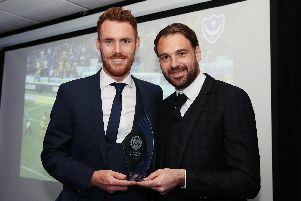 There doesn’t appear any major stumbling blocks, however, to the defender representing the biggest fee paid by Mick McCarthy since becoming Ipswich boss in 2012. Cook has often spoken of his appreciation of Webster’s quality this season. But he made it clear he’s not afraid of selling to cover his squad surgery this summer. Cook said: ‘You’d sell any player if there was a benefit to us going forward. That’s just logic. ‘I’m saying we would sell a player if they left to make the team better. ‘Footy is footy. I am not against change, we have to improve, I want us to have the pride back in the club. ‘My job is to ensure that the team evolves now and we get better. Whether that means we lose someone then we sell someone. ‘I wouldn’t be against anyone leaving. If we sell someone, we sell someone. ‘I have been phoning managers lately about one or two of their players under contract that we would like to take if we can agree a fee. ‘Our club is no different. If I thought it was a deal I wanted to do then I would say “Yes”. Despite Webster being on his way, Cook made it clear he is under no pressure to sell players to bankroll recruitments. Similarly, no player has requested to depart, but the Webster move fits the bill of business which benefits Pompey. Adam (Webster) is a great lad, great kid, we don’t want to sell players,’ said Cook. ‘As a club we don’t have to sell anyone, I can only reiterate that. ‘People say players aren’t available. They are all available. ‘If it is a deal which benefits our on-the-pitch thing it would be my call to make that decision. ‘I would not be scared to make that call if I thought it would help us. ‘Our club is about trying to get success now, it is what our fans pay for. ‘We have to make sure if someone was to leave it was to mean the playing team was getting better. Logically. ‘Nobody has said they want to leave, we are not touting players, we are not trying to invite anything like that.